FLAWLESS: With a perfect 9-0 record in 2013, Morales finds motivation in a battle off of the field. The petite and gentle 12-year-old Emily Morales steps up in front of the television screen. She takes her mark and fires a bowling ball down the lanes like a professional — the ball collides successfully and violently — strike. Andrew Morales, UC Irvine’s starting Sunday pitcher who has thrown for a perfect 9-0 record this season, doesn’t have quite the spotless record in Wii bowling like his younger sister Emily does. “She was one strike away from a perfect game, she beats me every time,” Andrew said on his little sister’s close-to-perfect bowling scores. 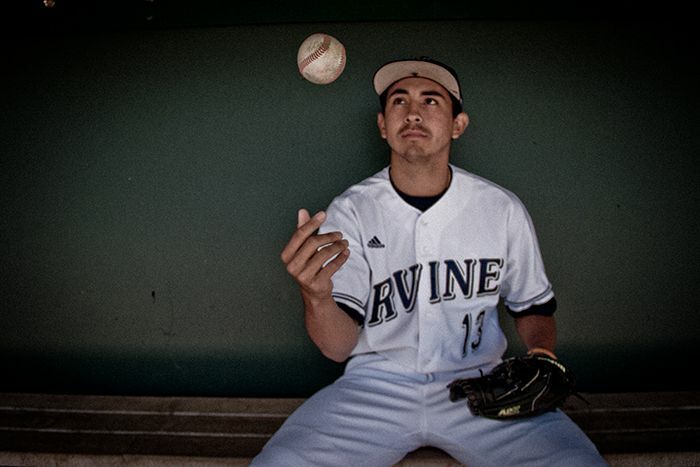 With a competitive edge and a perfect record 11 weeks into the 2013 season and a 1.60 ERA, Morales has done everything in his power to make sure that he gets a W, not so that he can see another win next to his name, but so that he can add a W to Irvine’s win column. 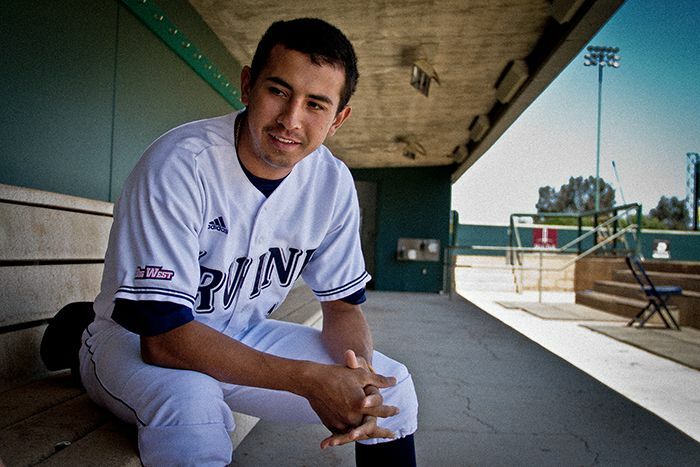 Just in his first year at Irvine, Morales has already garnered Big West Weekly honors twice this season. Morales received his first Big West recognition on April 8 after throwing a one-hitter against Hawai’i with six perfect innings, climbing to a perfect 7-0 with the win. Then on April 22 against Cal State Northridge, the starter threw a career-high 8.1 shutout innings that extended his scoreless inning streak to 22.2 frames. Morales struck out eight in the outing, just one shy of his personal best. The Rio Hondo Community College transfer was also named the ESPN Zone Anaheim Anteater of the Week on April 23 for his efforts in the 1-0 victory over Pacific on the 22nd. A week prior to his Big West recognition, Morales was named to the College Baseball Hall of Fame Pitcher of the Year Watch List. The right-handed pitcher was second in the nation at the time with a flawless 8-0 standing. “You can’t be afraid to lose, and I’m not. I just give the best that I can and control what I can control. I don’t give [the perfect record] too much thought. Everyday I go into the game as 0-0,” the humble Morales said. When asked what makes it possible to own a perfect 9-0 after so many outings, the grateful RHP started naming off teammates and praising their talent and dedication. Morales, like his younger sister Emily, is dedicated to performing and to winning. While Morales spends countless hours perfecting his craft to get the wins while at war on the field, he has a greater battle on his mind and a even sweeter victory to celebrate. Emily, who plays Wii bowling with her big brother on any occasion that she can get, loves showing off the skills that she perfected after suddenly having so much extra time to spend at home. On October 21, 2011 at 11 years old, Emily was diagnosed with Acute Lymphoblastic Leukemia (ALL). While Morales beamed from ear to ear, he discussed phone calls from Emily, FaceTime sessions and her ability to always brighten his day. Emily, as well as the rest of his family, is what makes the difference for Andrew on the mound. 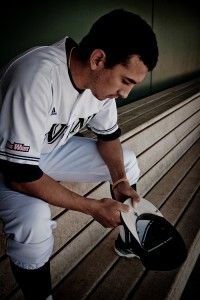 While Morales talks about the importance of a calm mentality during his outings for the ’Eaters, he is never alone on the bump — with “EM” written in black sharpie on the underside of the bill of his cap, Andrew takes Emily with him on the field for every game that he throws. As his little sister’s biggest advocate, the newcomer talked with coach Gillespie prior to the first game of the season about Emily throwing out the first pitch in 2013. So, on February 15 against Baylor in the season opener, Emily hurled the first pitch of the year in Anteater Ballpark with as much fineness and skill as her big brother. As a Division I athlete and ballplayer, it is not his flawless record that defines him, it is his unwavering spirit. As passionate as the pitcher is about the game that he loves, it is evident Emily has his heart.